14.12.2016, Tbilisi – the Georgian Foreign Ministry hosted the presentation of projects under the Council of Europe Action Plan for Georgia 2016-2019. The Document comprises projects to be carried out in Georgia by the Council of Europe during the years 2016-2019, and aims to cooperate with the Georgian Government in the implementation of reforms in such areas as human rights, democracy and the rule of law. The Council of Europe Action Plan is largely financed by the Council of Europe and the EU. The Council of Europe can also accept voluntary contributions from member, non-member and observer states, as well as form international organizations, foundations, legal and physical persons. The aim of the meeting was therefore to obtain funds for the implementation of the aforesaid projects. Representatives of the diplomatic corps accredited to Georgia, heads of ministries and institutions directly involved in the implementation of projects under the Action Plan and the Council of Europe Office in Georgia took part in the meeting. 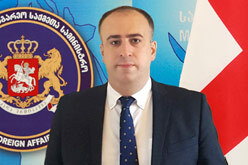 Georgian First Deputy Minister David Zalkaliani and Head of the Council of Europe Office in Georgia (CoE) Christian Urse appeared before the participants of the meeting. Representatives of the Council of Europe Office in Georgia made presentations on the projects to be financed under the Action Plan. Deputy Minister of Corrections Zviad Mikhanashvili, Deputy Public Defender Ekaterine Skhiladze, Rector of the Ministry of Internal Affairs Academy Givi Mikanadze, Personal Data Protection Inspector of Georgia Tamar Kaldani spoke about the successful co-operation between Georgia and the Council of Europe highlighting the priorities of the Action Plan. At the end of the meeting, the participants expressed their readiness to activate co-operation with the Council of Europe towards implementation of the reforms.